Sarabhai vs Sarabhai is an Indian sitcom created by Jamnadas Majethia and Aatish Kapadia. It was directed by Deven Bhojani, starring an ensemble cast including; Satish Shah, Ratna Pathak, Sumeet Raghavan, Rupali Ganguly and Rajesh Kumar. It revolves around a quintessential upper-class family living in South Mumbai. The series was produced by Hats Off Productions. The show was originally broadcast from 2004 to 2006, on STAR One. The show returned as a web series on Hotstar in May 2017. The show revolves around the life of an upper class Gujarati family, the Sarabhais, who live in a luxury apartment building and later in penthouses in the upmarket Cuffe Parade area of South Mumbai. The family consists of Indravadan Sarabhai and his wife Maya, who live in an apartment with their unmarried younger son Rosesh. Their older son Sahil and his wife Manisha live in the apartment across the hallway. Maya considers the name Manisha middle class and renames her Monisha before their marriage. Monisha's middle-class habits irk Maya. Monisha, on the other hand, does not appreciate Maya's snooty and snobbish behaviour. Indravadan constantly derides Rosesh for being tied to his mother's apron strings and for writing bad poetry. Maya and Rosesh consider Indravadan's attitude towards Rosesh and his gregarious nature boorish. This all ensues conflict and comedy. Much of the humor is derived from the fake, artificial and shallow interactions among the city's elite and their perceived notions of the shortcomings and failings of middle-class society. Indravadan Sarabhai: Satish Shah portrays Indravadan Sarabhai aka Indu; a rich, ex-director of a multinational company, he constantly amuses himself by making fun of his wife and picking on his younger son, Rosesh. He always sides with his daughter-in-law Monisha in case of a brawl between her and his wife Maya, which always turn out to be very funny.He is irritated by his hearing impaired brother-in-law Madhusudhanbhai's exclamation “Hain?” every time he says something. He never pays heed to his wife and does what he wants. He is mischievous and still a child at heart. He likes playing pranks at Rosesh and imitate him that annoy Maya to no end. He can't keep a secret and usually pits two people against each other. These traits of his earn him the moniker Nārad Muni. Maya Majumdar Sarabhai: Ratna Pathak Shah . She is Indravadan's wife and likes only the creme de la creme in every aspect of her life and her family. Her bone of contention is her daughter-in-law, Monisha, who is from a middle class Punjabi family. Her confrontations with Monisha are always very suave and sugar-coated. She assures that Rosesh doesn't marry someone who is middle class, like Saahil. As a result, Rosesh has trouble finding a girl his "Momma' will like. She dislikes her son-in-law Dushyant’s tech savvy behaviour and likes to maintain a distance from him. A prominent socialite and general secretary of the society, she is the lady of her house and very efficient in household chores. She is always running after her husband to stop him from eating unhygienic food. Her constant refrain is "It's so middle class!" 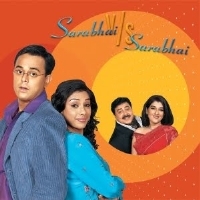 Saahil Sarabhai: Sumeet Raghavan portrays Sahil Sarabhai, the cosmetic surgeon, Indu and Maya's son and eldest child. He is Monisha's husband. He is soft, noble, wise and attached to both his mom and wife. He dislikes hurting anyone. He is the quintessential 'Indian male sandwiched between his wife and family'. He is wiser than his father Indu in tackling matters between his wife and mother and always tries to make them get along with each other. But, with his younger brother, Rosesh, he has a funny bone and like his father, enjoys making fun of him. Monisha Singh Sarabhai: Rupali Ganguly, a middle class, Punjabi girl from Noida and now the daughter-in-law of the Sarabhais. She never tidies her house and always haggles for pennies and is constantly ticked off for this by her mother-in-law. She is an avid daily soap watcher and grows suspicious of her husband's loyalty to her very quickly. Despite being a careless homemaker, she is an honest, innocent, loving girl and is always supported by her father-in-law. Maya made her change her name from Manisha to Monisha insisting that Manisha was "too middle class". Rosesh Sarabhai: Rajesh Kumar portrays Rosesh Sarabhai, the second son and youngest child of Maya and Indravadan. He is a theatre artist, aspiring actor and a poet. He is the favorite of his mother Maya. Maya is the only member of Sarabhai family who approves of and appreciates his absurd poetry and acting skills. He has a love-hate relationship with his father as he is always the target of his father's jokes and pranks. He can't bear the thought of being separated from his “Momma” and always seconds Maya even if he doesn't feel so. He has a peculiar and amusing voice and his poems are always bad, but funny. Other recurring characters include Ilaben, Indravadan's sister portrayed by Rita Bhaduri; Madhusudhanbhai, a hearing impaired brother-in-law of Indravadan Sarabhai portrayed by Arvind Vaidya; Dushyant Painter, son-in-law of Sarabhais portrayed by Deven Bhojani; Sonya Sarabhai Painter, a voodoo and daughter (second child) of Indravadan and Maya portrayed by Kshitee Jog / Shital Thakkar in Season 1 and Aishwarya Sakhuja in season 2. The season 2 introduced some new characters; Arnab Sarabhai aka Guddu, 7-year-old son of Monisha and Sahil as well as Jasmine Mavani, an actor and singer from Jamnagar, Rosesh's love interest portrayed by Vaibhavi Upadhyay. In the final episode, the principal characters are seen stating that there would be another season of the series. After seven years, the life of the Sarabhai family has not changed much. Now Monisha and Sahil have a seven years old son Aurnob aka Guddu and finally Rosesh has found his love interest also gaining the main role in a TV serial which he eventually loses. The family has moved to new penthouses.The season ended with Monisha taking Aurnob to Noida and indicating for a new season . The show was produced by Jamnadas Majethia under banner of Hatsoff Production. The show was directed by Deven Bhojani and the story and screenplay was written by Atish Kapadia. In 2012, Deven Bhojani denied that the series would return. The cast reunited in June 2016 over a belated 65th birthday party of Satish Shah when the future of the show was discussed. The producer Jamnadas Majethia promised some good news for the fans. Later, the actors of the show confirmed the return of the new season as a web series entitled Sarabhai vs Sarabhai: Take 2. The series was picked up by Hotstar with the same cast, and the story is set after seven years of the last season's conclusion. Deven Bhojani, a popular TV actor, made a debut as a director of the first season. He also played recurring character of Dushyant in the series. The first season was shot on the sets located at Kanjur Marg in suburban Mumbai. The cast was provided with their own rooms backstage with nameplates with each character's name for rehearsals and preparations. The Season 1 was broadcast from 2004 to 2006 on STAR One. Season 2 was released as a web series on the Star network's digital platform Hotstar starting May 2017. The season 1 was a weekly show and was closed after two years due to low TRPs. The newly introduced stand-up comedy shows on the same network garnered TRPs as high as 9 while the Sarabhai received TRPs of as low as 0.63. The series started re-run of episodes as a daily show and it became popular. The series gained a cult following. The season 2 was one among the most anticipated sitcom sequels, it opened with positive critical as well as viewer reception. but later the show was heavily criticised for its poor writing and sets but praised for its performances though. The Show won 5 Indian Telly Awards & Indian Television Academy Awards in 2005. ^ a b "Sarabhai vs Sarabhai Take 2 first episode review: This time it is funnier and more insane". The Times of India. 16 May 2017. Retrieved 19 May 2017. ^ "'Sarabhai vs Sarabhai' won't come back: Deven Bhojani". Times of India. 15 May 2012. Archived from the original on 4 February 2013. Retrieved 17 October 2012. ^ Lohana, Avinash LohanaAvinash (14 March 2017). "Sarabhai series to kick off by month-end". Ahmedabad Mirror. Retrieved 19 May 2017. ^ "Sarabhai vs Sarabhai shoot to begin soon: JD Majethi". ^ "Sarabhai Vs Sarabhai to Return as Web-Series Soon". ^ "Aila! 'Sarabhai vs Sarabhai' to Return as a Web Series This Year". ^ "It's Confirmed! Sarabhai Vs Sarabhai Is Coming Back, This Time As A Web Series". Retrieved 20 September 2016. ^ "Here's why Sarabhai vs Sarabhai, Hip Hip Hurray returned as web series". Hindustan Times. 11 July 2016. Retrieved 26 February 2017. ^ "Sarabhai vs Sarabhai to return in May. Here's its cast then and now". The Indian Express. 15 March 2017. Retrieved 25 March 2017. ^ a b "On the sets of Sarabhai vs Sarabhai". Rediff.com. 29 June 2005. Retrieved 19 May 2017. ^ a b "EXCLUSIVE: Sarabhai vs Sarabhai Take 2 cast opens up about the new season; makers hint Khichdi might return as a web series". India Today. 16 May 2017. Retrieved 19 May 2017. ^ "Sarabhai Vs Sarabhai - Take 2". Hotstar. Retrieved 15 May 2017. ^ Unnikrishnan, Chaya (5 November 2016). "Satish Shah feels Sarabhai Vs Sarabhai was the first failure of his TV career". dna. Retrieved 19 May 2017. ^ "Sarabhai Vs Sarabhai Take 2 review: Clean comedy show torn between classes and masses". Firstpost. Retrieved 1 March 2018. ^ Chawla, Ankita. "'Sarabhai Vs Sarabhai Take 2' is funny, but it's not as sharp as the original cult comedy series". Scroll.in. Retrieved 1 March 2018. ^ "The Hero Honda Indian Television Academy Awards 2005". IndianTelevisionAcademy.com. Archived from the original on 4 May 2012. Retrieved 12 January 2012. ^ "Star One sweeps Telly awards". Rediff.com. 7 November 2005. Retrieved 12 January 2012. This page was last edited on 19 March 2019, at 13:18 (UTC).